New York Motorists Vote To Shift Wreaths That Have Infuriated Them For Years The Holland Tunnel became the subject of a fervent petition to change which letters its holiday decorations should adorn. In what could be called a Christmas miracle, the Port Authority listened. Holiday decorations adorn the letters on the toll booths at the Holland Tunnel last week in Jersey City. Are New Yorkers too demanding or are they simply people who speak up when they see a better way? Let's take a look at a story about some Christmas decorations, and you be the judge. "[E]very Holiday Season it is decorated with 2 wreaths and a Holiday Tree. But for some reason the tree is over the letter N in the word Holland instead of the letter A where it would fit perfectly. ... [It's] just unsightly and ruins the holiday festivities for people to enjoy on such a great piece of architecture. "I am asking you to join with me in asking the Port Authority of New York and New Jersey to move the tree decoration over from the letter N to cover the A. This is the time where ALL PEOPLE should be celebrating and have an opportunity to enjoy the decorations and festivities. This country is divided already, let's start doing things to bring us back together." It turns out that Windelspecht spoke for the quietly seething commuters of New York-New Jersey, and his petition quickly garnered 1,500 signatures. He said other motorists reached out to him to commiserate. "One guy told me he avoids the Holland Tunnel and takes the Lincoln for the entire month of December, even though it adds an hour to his commute," Windelspecht told NJ.com last week. "Don't get me wrong: I'm a huge Christmas guy. There's no better time in the city. It's an awesome time of the year — and that's the entrance we have?" The Port Authority took notice and conducted its own survey — attracting more than 21,000 votes in five days. 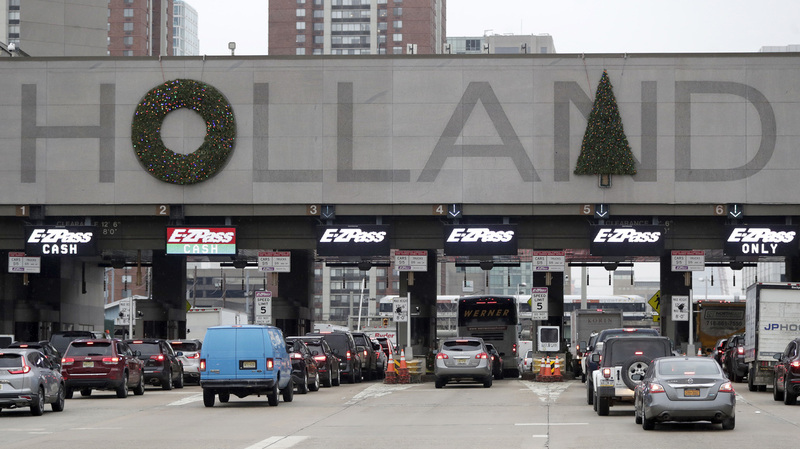 "The Great Holland Tunnel Decoration Debate has concluded with voters clearly siding with change and electing a design that will shift the tree currently hanging over the 'N' to the 'A' in the word 'Holland' and will remove the second wreath hanging over the 'U' in 'Tunnel.' "
"The Holland Tunnel is about to bring even more comfort and joy to its travelers this holiday season," Port Authority Chairman Kevin O'Toole said in the press release. "In true holiday spirit, may this change help bring more of us together." More than 80 percent of voters wanted changes to the decorations, the agency's executive director said in a press conference about the matter on Monday. Windelspecht was gratified by the news – though he says he never had any problem with the second wreath. The Christmas — or perhaps Festivus? — lesson to this tale: There can be great strength in shared irritation. As Windelspecht told The New York Times, "It just goes to show you how many people see it, and they go, 'Oh my God, that's me! That just bugs me too."